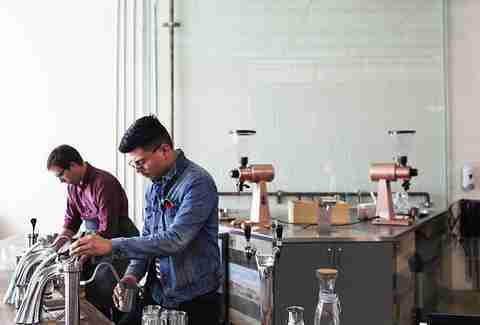 If coffee is black gold, then there’s been a Gold Rush in the past decade, with specialty coffee powers descending on LA from across the US. 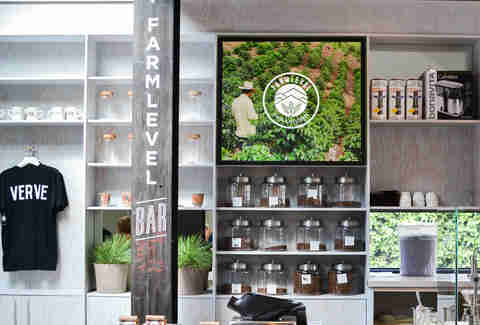 Homegrown coffee companies have also stepped up, with some developing chains sourcing coffee and others roasting their own beans in-town. In all cases, Angelenos have benefited -- and here are the 24 best of the batch. Alfred’s iconic sign, “But first, coffee,” is inherently Instagrammable and reinforces the shop’s core focus: pumping out plenty of espresso drinks and cold-brew coffees, and all using Stumptown beans. Since the opening of Zad’s first cafe in 2013, he’s expanded his stylish brand to half a dozen locations all over the city, and even launched a new concept, the Alfred Tea Room, where you can take an equally postable pic of your iced matcha green tea. And on top of all that, you can regularly find Yeastie Boys’ ridiculously tasty bagel sandwiches at the Alfred in the Alley and Alfred Silver Lake locations. The cousins behind Wurstküche teamed with Tyler Wells, a co-founder of the late, great Handsome Coffee Roasters, on this sleek Arts District coffee bar. Douglas fir and marble are keys to the hip-and-clean aesthetic, and Sightglass coffee, Straus milk, and top-of-the-line equipment all make sure the brews stay true. 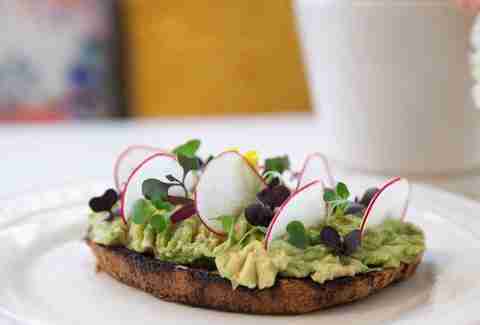 Blacktop’s also supplemented its offerings with creative Sugarbloom pastries and a few different toasts (including, obviously, one with avocado). Alex Morales and brother Alan spent time at Handsome Coffee Roasters and Tiago Coffee Bar + Kitchen before branching out on their own with Civil Coffee. Their stylish café on an emerging stretch of Highland Park sports an eagle logo and contains a white-and-blue color scheme and a high ceiling. The baristas brew Coava and Heart coffee, and Roomforty contributes ambitious coffee bar fare, including vegetarian avocado toast topped with shiitake “bacon,” and hearty grain bowls topped with all the fixin's, like spicy merguez, feta, and pepitas. The only thing missing is Wi-Fi, which is intentional: It’s to accommodate families... who apparently don’t like Wi-Fi? This growing chain, which has an imposing rooster logo on the wall and the obligatory Instagram-friendly tile, now keeps studio workers well caffeinated throughout TV, film, and radio production. It rotates mostly West Coast roasters, and serves all cups with foamy panache. Bonus: The Burbank location is the only branch of Coffee Commissary that has a full kitchen, meaning you can find fried chicken sandwiches, breakfast burritos, and impressive house-baked goods on a daily basis. Considering owner/architect Yeekai Lim earned his bones with pop-up coffee bars around the city, it’s nice to see a fully realized take on his vision. At his first location in Culver City, he built a beautiful indoor-outdoor space amidst art galleries, complete with colorful chairs and a wise owl logo, and his other Downtown LA spots are equally sleek and modern. Cognoscenti’s countertop coffee line-up changes depending what’s really popping that season, though Seattle’s Kuma Coffee and San Francisco’s Ritual Coffee make frequent appearances. This multifaceted café has managed to stand out in Old Pasadena, a neighborhood that has seen a glut of coffee concepts in recent years. 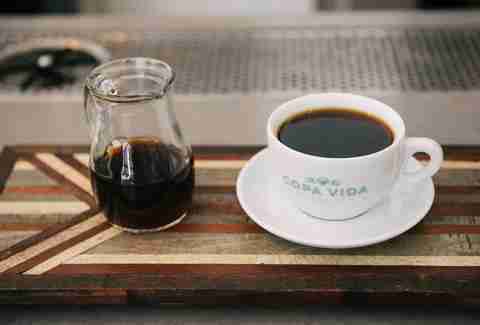 Superlative West Coast roasters normally find their way into Copa Vida’s grinders and brewers, including single-origin selections from industry leaders like Ritual, Verve, and 49th Parallel. 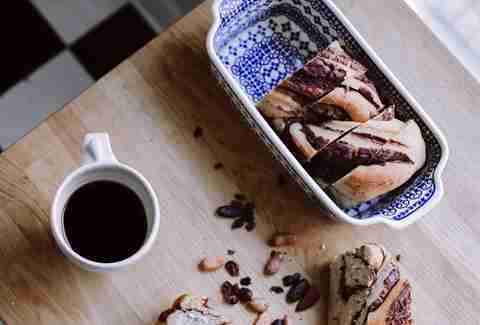 They also bake in-house, yielding bread that helps to fuel sandwiches and plenty of coffee-friendly pastries. Given the name, we were hoping for a T-Rex, and we found a miniature version on one of the gorgeous Douglas fir shelves (and a bigger beast on the bathroom wall). A longtime hospitality pro and her husband, who co-created Cards Against Humanity, serve Four Barrel coffee in a sharp space, which used to be an audio speaker repair shop. 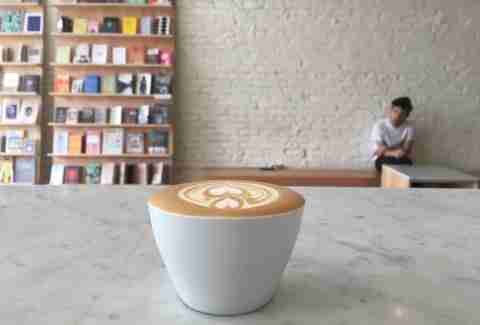 Soo Kim’s coffee bar looks like it was born to appear on lifestyle blogs. Her airy space, which resides along an especially fashionable stretch of Echo Park, sports white walls (including white brick), a tile-backed marble bar, and wood-bench seating, and baristas brew Heart Coffee in vac pots, with a La Marzocco espresso machine, and as cold brew, which packs a potent punch and comes in a glass big enough to keep you conscious for at least two days straight. Jack Benchakul is a coffee scientist who applies exacting standards to his minimalist coffee bar in Chinatown’s Far East Plaza. If you’re looking for a jolt of endorphins and caffeine (Endorffeine!) this is the place. Sit at the nine-seat, horseshoe-shaped bar and watch the master at work behind the stainless steel Modbar. Signature drinks are super-strong, with iced lattes flavored with unique combos like palm-sugar whiskey and vanilla-pandan. Benchakul also hosts “9”: a three-course pairing that takes place on Monday nights and matches desserts with coffee cocktails. Espresso Cielo has two primo locations, each just a few blocks from the beach with Carrera marble and sky blue styling to spare, and an antique clock that would make Flavor Flav jealous. A strong coffee program complements the refined surroundings, including 49th Parallel coffee beans roasted in Vancouver and Kyoto-style towers that slowly drip masterful cold brew. Even in this group, there’s something about Kyle Glanville and Charles Babinski’s open-air Grand Central Market stall that stands out. Sure, the barista champs take a meticulous approach, sparing no gram when pulling espresso shots or brewing cold brew, but the duo also has fun. Just look at their specialty drinks like their turmeric-ginger and almond macadamia, or the powerhouse shake made with GCM neighbor McConnell’s ice cream. A seasoned veteran named Christopher “nicely” Abel Alameda, who clocked time behind some of Seattle and LA’s best coffee bars, runs this quick-grab spot within shouting distance of Venice Beach’s drum circles. 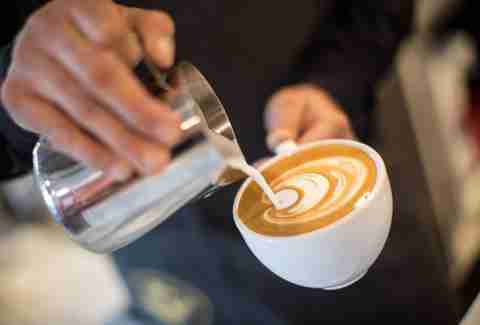 Four Barrel Coffee gets the star treatment, and their latte art is probably the city’s best -- after all, nicely is a three-time winner of the Latte Art World Championship. And -- shhhh -- Menotti’s also has a secret menu (with unique drinks like an espresso & tonic, and the “Love Potion #9” with raspberry syrup and chocolate ganache) hidden behind a photo of its founder on the counter. This similarly precise coffee bar from Misters G and B in Larchmont Village may be even more ambitious, with pastries and food made in-house, indoor seating, and a hand-painted astronaut who looks like he’s floating across the wall. If you’re willing to risk cardiac arrest, consider the Full Nelson, a flight of coffee drinks named for a regular customer that includes an espresso, macchiato, cappuccino, and the phenomenal G&B shake. The new (and even hipper) location in Los Feliz boasts a large front patio shaded by trees, perfect for those quintessential LA weekend brunches. Speaking of which: In addition to serving similar coffee offerings (including the famed iced almond macadamia latte), they prepare Filipino-inspired breakfast dishes, like adobo grain bowls and savory rice porridge with roasted chicken. The dream team that opened this Sunset Junction coffee bar in 2007 has long since disbanded, but Intelligentsia’s first LA branch remains a juggernaut. The coffee is roasted in nearby Glassell Park, the quality remains good given the high volume, and the signature Angeleno beverage is as popular as ever, featuring a quadruple shot of espresso shaken with milk, agave, and ice. 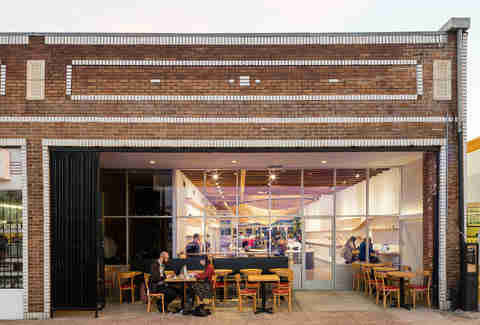 It took three Aussies (Jin Ng, Mark Dundon, and Russell Beard) to reinvigorate a former Fairfax Village produce market and turn it into one of LA’s best coffee shops. They first teamed on Paramount Coffee Project at the one-time Australian headquarters for Paramount Pictures, and are now brewing some of the world’s best coffee beans. The concrete and wood space features a multi-roaster lineup that rotates beans from American coffee powers like Heart and George Howell, plus coffee from roasters back home. The food program is more ambitious than most coffee bars, featuring plates like a burrata that’s accompanied by pistachio dukkah, kale, and eggs; and a Superfood Bowl that comes with quinoa, candied beets, lebni, blueberry, and cocoa. LAMILL co-founder Jean Shim went solo in 2015, debuting her fashionable coffee bar in Hollywood’s Columbia Square complex, in a space that features blue-grey and red walls lined with art and two elaborate chandeliers, including one crystal and another that resembles spaghetti. They promote BKON vacuum processed RAIN technology for coffee and tea, and they have many nitro drinks, which you can order up as a cascading nitro flight with cold brew coffee and three teas: matcha, ginger ale green, and hibiscus. Janine Awan and husband Saadat got the Echo Park coffee scene rolling with their rustic café just north of the lake. Reclaimed wood, box seating, and red walls give life to this neighborhood favorite. 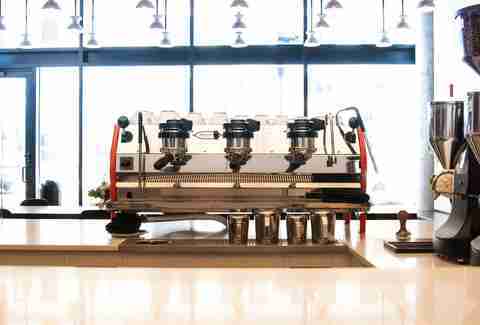 It also helps that they brew expertly roasted beans from San Francisco’s Wrecking Ball Coffee Roasters on their sleek Faema espresso machine, which sports a racing stripe. Clearly, this bar was built for speed, but the crowd is always chill. Like in that Portlandia sketch where a couple grills the waiter to find out where their chicken was sourced, coffee nerds patronizing Bar Nine could easily get all their detailed questions answered here. Jereme Pitts and Zayde Naquib, the owners behind this sleek and industrial coffee shop in Culver City’s Hayden Tract, are involved in every step of getting the bean to the cup. The duo works with Ninety Plus Coffee Agents to source coffee beans from Panama and Ethiopia, and then roasts them in-house. 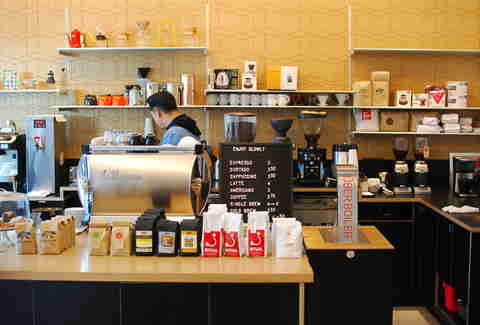 Bar Nine’s baristas use the shop’s high-tech Modbar system with Chemex coffeemakers to get the precise cup of joe. It’s all in the little details, too, like how the to-go coffee gets served in adorable glass jars with lids. Try the creamy hazelnut milk latte, and don’t forget about breakfast: Highland Park’s Amara Kitchen has a daily pop-up in the cafe serving gourmet organic and healthful offerings like the Purple Egg Pot, a jar filled with poached eggs and pesto over purple potato mash. And if you want to learn from some of the best, they offer cupping and latte classes on the reg. This charming cafe nestled in the Fashion District has a distinct style of its own. 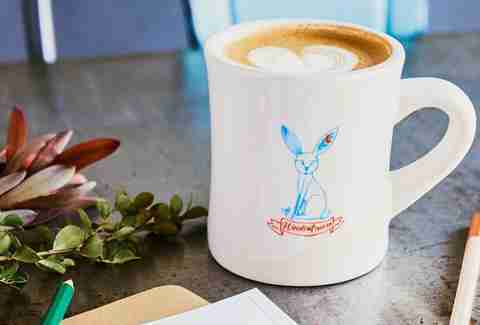 It’s decorated with stacks of chromatic hardcover books and vintage knickknacks, and its menu is cleverly integrated inside a black-and-white drawing of a Chemex pourover on the back wall. Even its snazzy white La Marzocco espresso machine is decked out with black-lined drawings of anime and Sanrio characters. The design is hip, yes, but let’s talk about the coffee: The beans come from Coffee Colab co-owner William Miyazaki’s Downtown-based Suits & Knives Coffee Roasters. 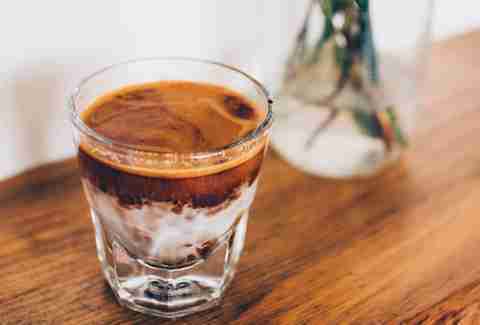 If cortados and lattes aren’t enough to get your buzz on, order the off-menu “Bruce Lee” for a one-inch punch of espresso, sweetened condensed milk, and whole milk. 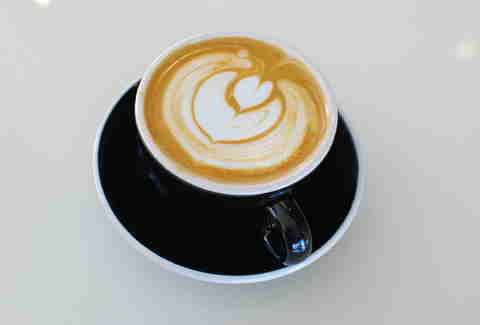 We like to think of Demitasse as one of the OG purveyors of craft coffee in LA. Owner Bobak Roshan was among the first in the city to start using siphon coffeemakers, making his humble Little Tokyo cafe look more like some steampunk coffee lab. 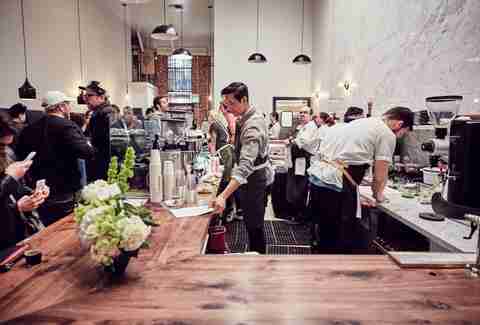 Now he’s opened a few more outposts throughout the city, and propelled Demitasse into becoming a micro-roaster. 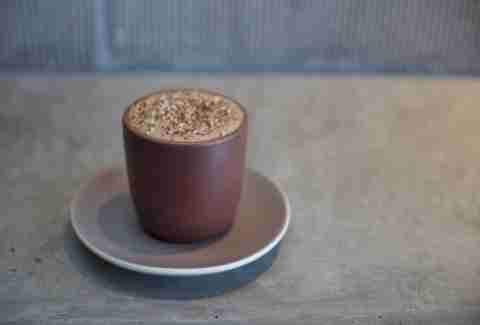 For that je ne sais quoi, get Demitasse’s specialties like Kyoto cold brew, and lavender hot chocolate that comes topped with a roasted marshmallow. 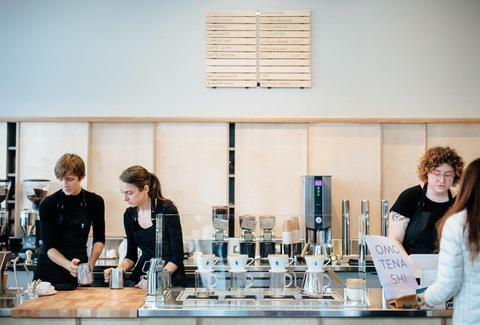 If you want to geek out a bit, Demitasse also offers cupping and roasting classes. 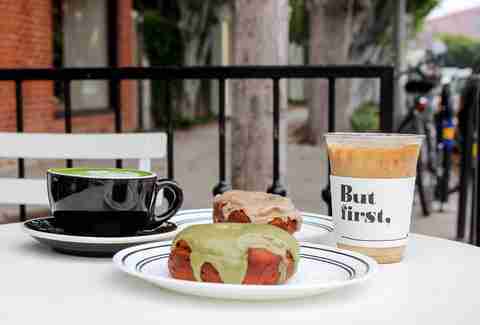 When Annie Choi left Demitasse’s Santa Monica outpost as general manager, she made a big jump and launched Found Coffee: a bright and airy cafe in Eagle Rock, punctuated with pops of color like green metal chairs and a yellow La Marcozza espresso machine. She hasn’t forgotten her roots, and still serves Demitasse’s roasted beans at her shop, but her patrons also get to try a rotating roster of roasters from all around the country -- this year, she’s bringing in the likes of Airship from Arkansas and Pure Intentions from North Carolina. Choi also brings in food vendors for pop-ups at Found Coffee, slinging everything from gourmet avocado toasts to next-level churros. She recently joined forces with Creme Caramel to open up a custard-and-coffee place, FrankieLucy Bakeshop in Silver Lake, where you can also get Choi’s special concoctions like her popular bourbon vanilla latte. We never get tired of percolating siphon brewing systems like the ones Balconi has, which produce coffee with clean and crisp flavor profiles. If you need a little more oomph to your drink, get its popular almond essence latte, a sweetened beverage that’s made with organic Straus milk. The baristas there take a little extra time with their latte art, sometimes conjuring up images of bears and swans for some truly Instagram-worthy drinks. 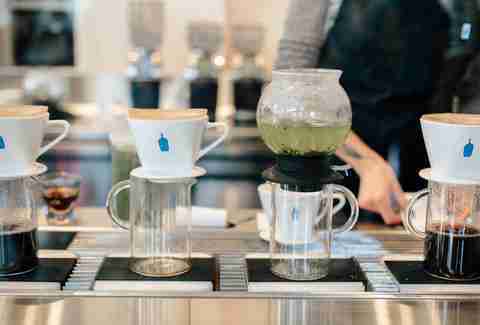 There was a huge hullabaloo when Blue Bottle took over Handsome Coffee Roasters in the Arts District back in 2014. 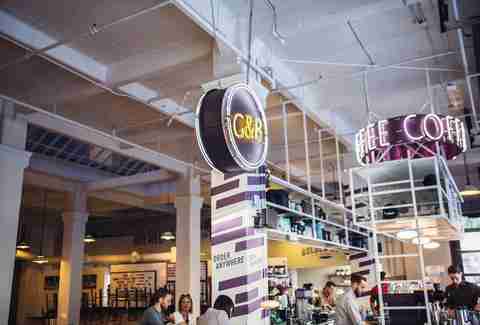 Since then, the Oakland-based coffee giant has expanded to eight locations scattered throughout the greater LA area. It’s still producing wonderfully rich and earthy coffee from the single-origin beans that’s roasted in-house at the Arts District location, and offering its popular NOLA-style, chicory-laced cold brew. 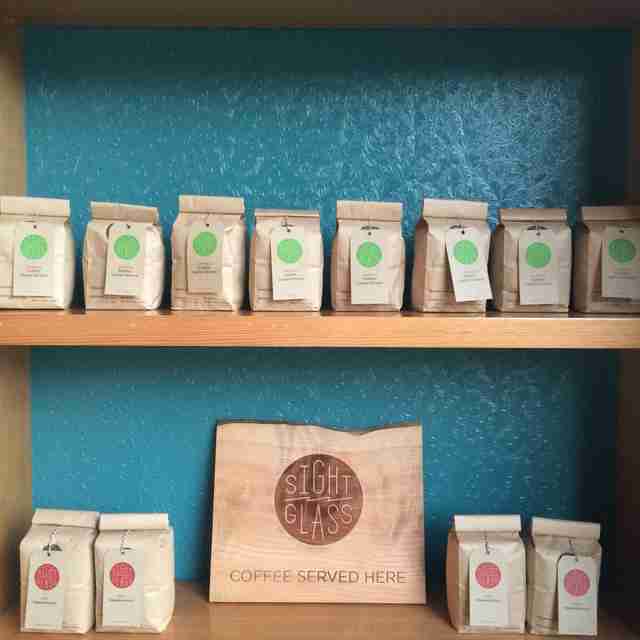 As an added bonus, the Arts District location offers roastery tours on Saturdays. Joshua Lurie is the LA-based founder of Food GPS, a company that showcases the best tasting food and drink through online coverage and by producing unique culinary events. Follow him at @foodgps on Instagram and Twitter. Jean Trinh is a Thrillist contributor who often gets her caffeine fix while writing at coffee shops. Follow her on Twitter and Instagram.